The Nihon Ki-in hosted the first International Amateur Go Tournament in 1963, which was attended by AGA administrator Robert M. Ryder of New Jersey. 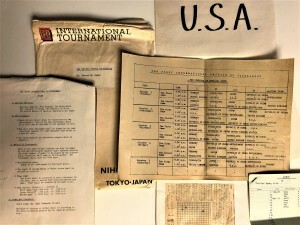 The packet included in Mr. Ryder’s papers in the archives includes the rules, schedule, and ephemera from what is marked as the first international go tournament held in Tokyo, Japan. Participating countries: Austria, England, West Germany, The Netherlands, The Republic of China, The Republic of Korea, The United States of America, Yugoslavia, and Japan. 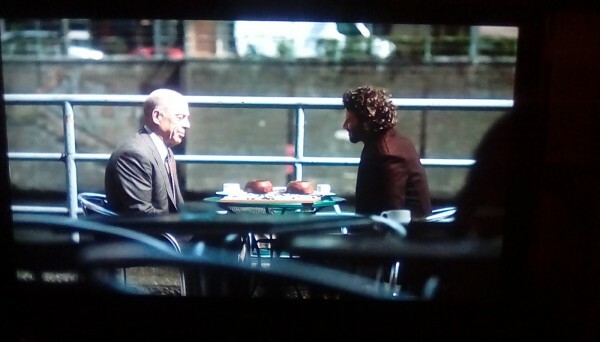 Mr. Ryder was very active in the AGA through the 1970s. Anyone who knew him or worked with him is encouraged to contact AGA Archivist Karoline Li at archives@usgo.org. Impressed with the dedication and focus of amateur players at the US Go Congress, Hai Li 5P is planning on coming back to the US to teach in the LA area. 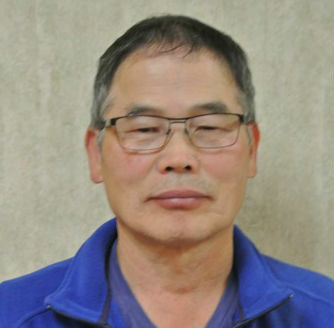 Attendees at the 2017 US Go Congress in San Diego will recognize him as one of the pro teachers, and the leader of a large delegation of his students and their families from China. Fourteen students aged seven to eleven and ranging from 2d to 5d came with Mr. Li (photo at right) to the Go Congress and participated in many of the tournaments and youth events, including the US Open. According to Mr. Li, they had a wonderful experience and felt challenged by their tournament games, which Mr. Li hopes will motivate them to study even harder after their return to China. 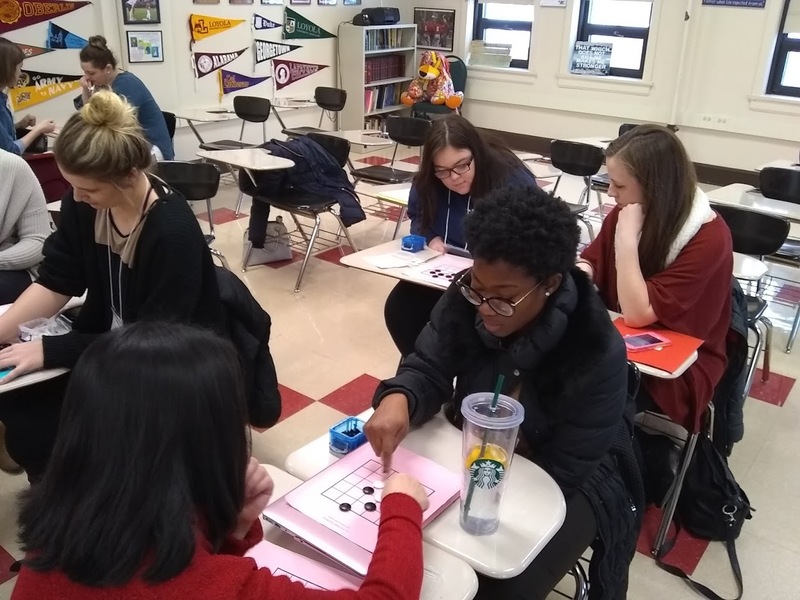 All fourteen students expressed the desire to return for the next Go Congress, and Mr. Li hopes that he can bring an even larger group of students to this year’s Go Congress in Williamsburg, VA. 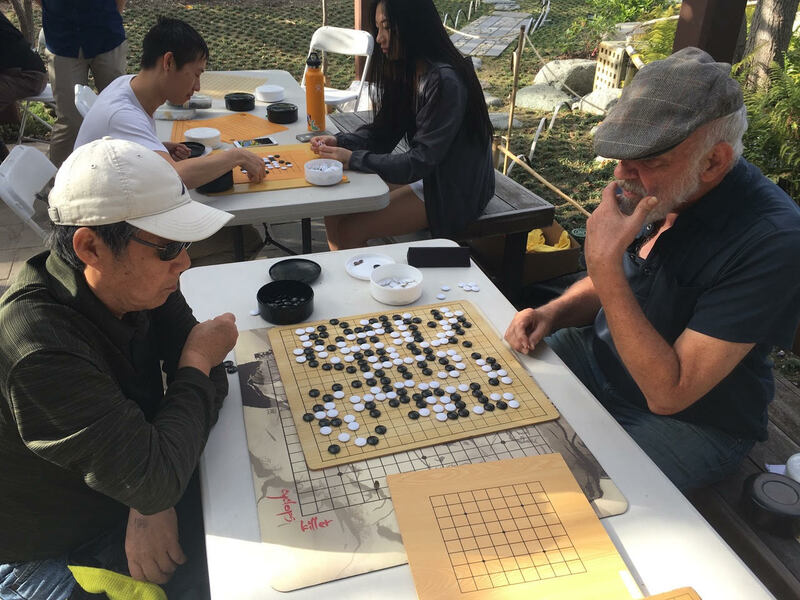 While observing tournament games at the Go Congress in San Diego, Mr. Li was struck with the focus and attention given to the games by the amateur players, particularly the kyu-level players. 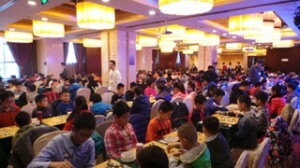 As a teacher, Mr. Li has trained many top players, including Shi Yue 9P, but now focuses most of his teaching on his go school in Tianjin, China that he built from just three students. JinHai Go School now employs nine other professional teachers – seven full time, two on contract – who train over 200 students in the main campus and satellite campuses around Tianjin. The focus of the go school is young amateurs, based on the belief that training in go is beneficial for the formation of good habits – focus, manners, intelligence, and improved academic performance. The students also train to improve their ranking, of course, which they can do at a large annual tournament around the turn of the new year. This past January, Mr. Li’s Bohai Rim Tianyuan Go Tournament (photo at left) concluded successfully, with nearly 800 players from Tianjin and five surrounding provinces participating – and even a few players from the US – participating. 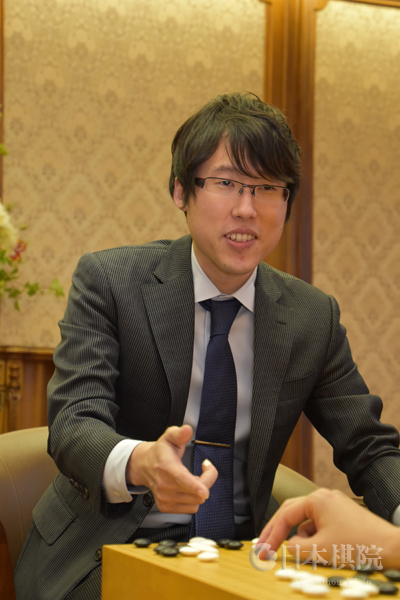 Mr. Li hopes that more go lovers from the US will attend the tournament in the future. 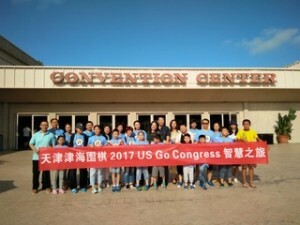 Mr. Li was moved by the importance with which the amateur players at the Go Congress treated the one-on-one playing experience, particularly the adult kyu-level players. 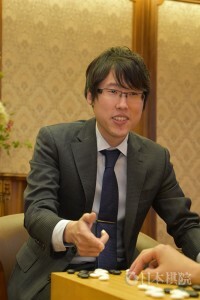 This inspired him to return to the US to promote Go to these players and more generally, and he is hoping to help grow the American go player base more actively by starting a branch of his go school here in the US this year, beginning in the LA area. Stay tuned! 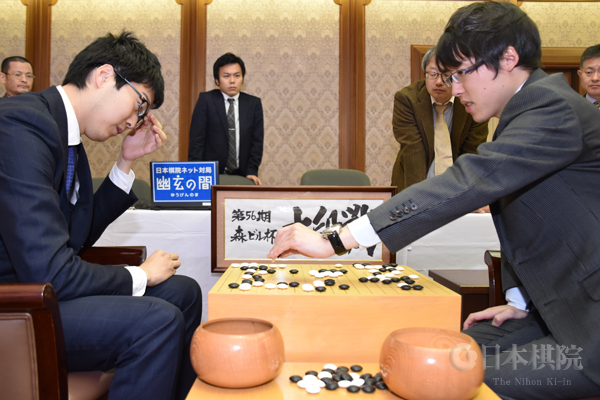 Iyama wins first Judan game: The Judan best-of-five got off to a start on March 6. 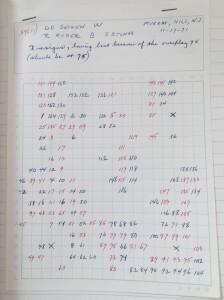 It was played at the same venue as the Women’s Meijin game, as detailed above. These two titles share a sponsor, the Sankei Nerwspaper, and it has been the practice in recent years to link them in this way. The challenger is Murakawa Daisuke 8P, who has been the top young player at the Kansai Ki-in for some time now. This is his fourth title match with Iyama. His first challenge was the only successful one: he scored 3-2 and took the 62nd Oza title from Iyama in 2014, but the following year he lost it to him 0-3. He also lost the 41st Gosei title match to Iyama by the same margin in 2016. 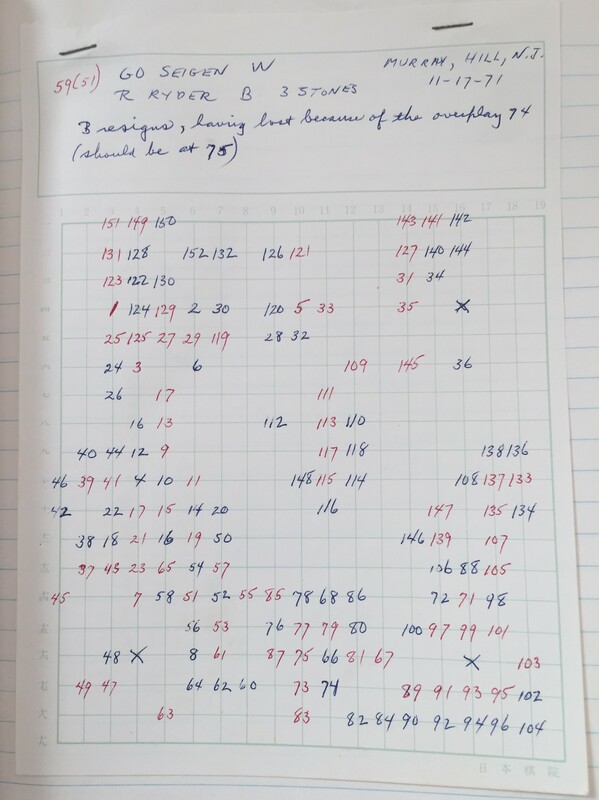 This is the reverse of the usual pattern, in which a young player fails in his first challenge but does better later. Murakawa’s record so far against Iyama is three wins to 14 losses: his only wins have come in their first title-match clash. In the first Judan game, Murakawa drew black in the nigiri. The tenor of the game was set quite early when Iyama played a cleverly timed sequence that turned an earlier move of his into an efficient forcing move. After that, the game developed peacefully for a while, but that was misleading; in the end, it turned into a capturing race between two large groups. This was won by Iyama, so Murakawa had to resign after 156 moves. The second game will be played on March 22. 73rd Honinbo League: The Honinbo League is one round and one game away from finishing. As before, Ida Atsushi 8P has the provisional lead, but he hasn’t yet played his sixth-round game against Yamashita Keigo 9P. Motoki is on 4-1. Yamashita on 3-2, and Ko Iso 8P on 4-2. One of these three will be the challenger. Results of recent games are listed below. (March 1) Ko Iso 8P (B) beat Shibano Toramaru 7P by resig. (March 8) Motoki Katsuya 8P (B) beat Yo Seiki 7P by resig. ; Kobayashi Satoru 9P (B) beat Hane Naoki 9P by resig. (March 1) Hane Naoki 9P (W) beat Yamashita Keigo 9P by resig. ; Cho U 9P (W) beat Murakawa Daisuke 8P by resig. (March 8) Kono Rin 8P (B) beat Takao Shinji 9P by resig. (March 15) Shibano beat Yo Seiki (don’t have details yet). To 3-dan: Tanimiya Ayako (40 wins; as of Feb. 27). Tanimiya earned her promotion after 37 years as 2-dan. Does Crazy Stone Deep Learning run on a Mac in Emulation? Looking for someone(s) who has(have) experience in running Crazy Stone Deep Learning on a Mac using emulation such as Parallels or VMWare Fusion. 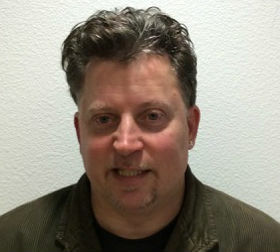 Robert M. Ryder, an active AGA administrator, kept meticulous organizational records as well as careful records of what seems to be the majority of his games. 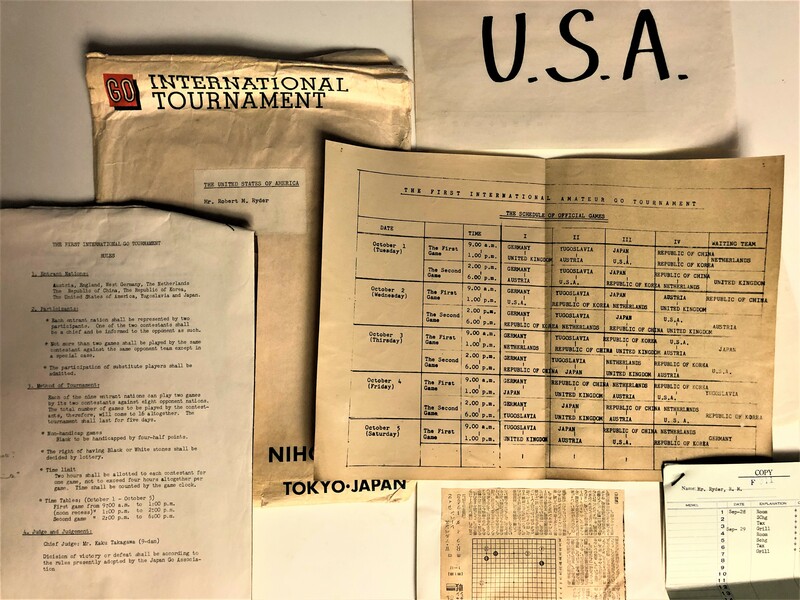 He played many others, and some names are easily recognized, as in this record of a game he played with Go Seigen in Murray Hill, New Jersey in November of 1971. 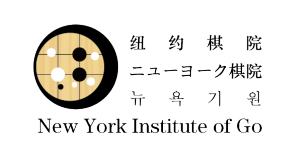 Anyone familiar with Go Seigen’s visit or Robert Ryder’s activity in the AGA is encouraged to contact AGA Archivist Karoline Li at archives@usgo.org. Club members played demonstration games against go playing visitors as well as taught go to people who had heard of the game but never played. Dozens of copies of “A Way to Go,” the go pamphlet given to AGA chapters every year by the AGF, were distributed. The club added several new potential players to its email list. The Davis/Sacramento Go Club held its Spring Tournament at the North Highlands-Antelope library on March 3. There was a field of eight players including Valerie Wong, who was playing in her first AGA tournament. Two patrons of the library expressed interest, and were given copies of “The Way to Go” and a brief introduction the game. The Upper Division was won by Ki Choi 2d (right), with a 2-2 record and the Lower Division by Tyler Moore 4k (left), with a 3-1 record.